I popped in to Whole Food to pick up some cheese and butter. I have only heard horror stories what the US’s farmers are allowed to use in dairy products – antibiotics, growth hormones etc. Whole Food is expensive but is only doing ecological, organic products. 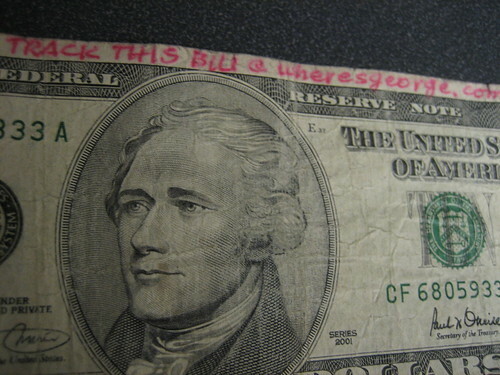 I have been to this website before, and I just had to enter this bill to see its history. This I like, it is fun and exciting. If this was advertising, that would have been a good one. A woman I work for has been big into Where’sGeorge for a couple of years, depending on how busy she is. I began to realize that she likes W.I.G. because she doesn’t get to travel like she used to, so now she can (has) to travel vicariously through her cash. It’s sort of sad when I look at it this way. I’ve taken bills for her to various places I’ve traveled to help her out.